Weak from hunger and exhaustion, members of the Willie company started from the base of Rocky Ridge early on the morning of October 23. William and Jane James, along with their children, started a little bit later because William and his oldest son, 14-year-old Reuben, helped bury two people who had died the previous day. Soon after the burial service, daughter Sarah James, age 19, led five younger siblings ahead to catch up with the rest of the company. They pulled the family’s lighter handcart. 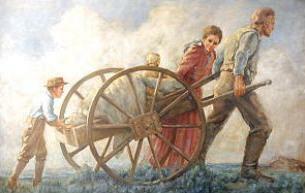 When the burial work was finished, William, Jane, and Reuben set out, with Jane and Reuben pulling the family’s heavier cart. As William tried to follow, he collapsed in the snow. For the previous several weeks, he had been in declining health. With Jane’s help, he tried to raise himself up but couldn’t do it. William assured Jane that he just needed to rest and asked her to go ahead and catch up with their children, so she left Reuben with his father and continued forward. Sarah James suffered tragic losses on her journey to Zion. A baby sister died on the voyage, and her father died on Rocky Ridge, but Sarah, her mother, and her six other siblings all survived. Sarah married the next year and eventually had six children. She lived to be 84 years old, faithful to the end. We visit the Trail of Hope, where the pioneer trek began, while in Nauvoo during our LDS Church History Tours. Come feel the faith of these pioneers!